Back when I visited Hong Kong in 2000, I met my mother’s cousin Suit Ying for the first time. It was one of those overwhelming love-and-admiration-for-my-family moments. She was a taller, younger, more gaunt version of my mother. She had then recently been granted residency in Hong Kong, after a few years in a refugee detention centre (she had arrived in Hong Kong from Viet Nam as an illegal alien). She has a huge smile, and was full of laughter and quite clearly excited to see my mother again, after about twenty five years. We met up with her near Temple St Market, because she was working at one of the little claypot rice restaurants which were springing up all over Hong Kong at the time. I don’t think it was Four Seasons, but it was over a decade ago, so I can’t really be sure. 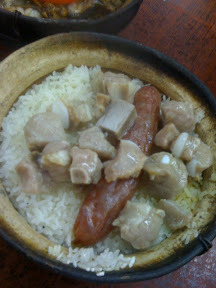 In any case, claypot rice was all the rage back then. And while it’s no longer so trendy, there are still quite a lot of places that specialise in it. 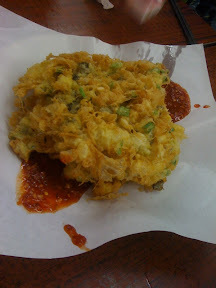 When researching places to eat in Hong Kong, of course @eatnik and I asked friends (and scoured their blogs). 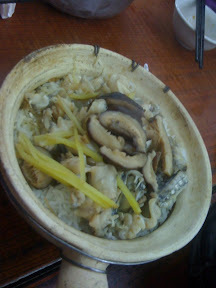 Both Phil and Jess had whet our appetites not only for claypot rice, but also for Four Seasons’ now famous oyster omelette. Oh, it also helps that Anthony Bourdain also recommended the place. We met up with the @eatdrinkstagger kids, who were also holidaying in Hong Kong that week. Expect to see a lot of cross-posting over the next few weeks between them and me. There was a little confusion as to where this place was, partly because google maps’ print functionality blows chunks, and partly because we were too lazy to enter addresses in our notes on our eating map. In any case, some quick smartphone usage and guidebook map referencing later, we found the place. Having been warned about a line forming pretty early in the evening, we opted for a blue-rinse special dining time of around 5:30pm. Which meant we walked into a half-full restaurant, and had an excuse later for supper. So, of course, the first thing we ordered was the oyster omelette. We got the large, which was quite simply humongous. The picture doesn’t really illustrate it very well. Never fear! After the previous day’s performance in Macau, I wasn’t going to let more food go to waste! Between the four of us, we managed to finish it off. The omelette is more like a fritter, really. Crisp and crunchy, with a generous serve of fresh oysters scattered throughout the batter, and a handful of spring onions thrown in for good measure, or just to make it slightly more aesthetically appealing, I’m not sure. I love oysters, and this omelette was full of them. The only problem I had with the dish was that the chilli sauce that it was served with was really salty. I would have preferred a chilli sauce with more vinegar in it, but I’m quibbling here. 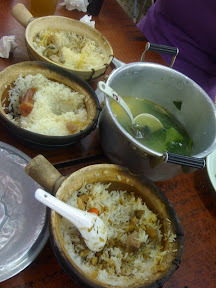 Of course, we also tried the claypot rice. We ordered (from left to right) the traditional classic:chicken with Chinese sausage, as well as frog and mushroom, and pork spare ribs with eel and soy bean paste. They weren’t all that exciting. Though to be fair, we probably didn’t douse them with enough soy sauce. 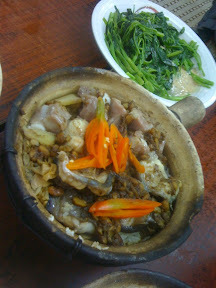 My favourite was definitely the ribs and eel, partly because soy bean paste is such an underrated condiment, but also because it was probably burnt a bit more than it was supposed to be – you want a little of the rice to burn to form a crunchy layer on the bottom of the claypot – which ended up giving the eel a great smoked flavour. 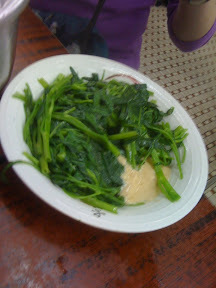 We also ordered some tung choi – a.k.a. eng cai or kangkung or rau muong depending where in Asia you are – which was simply boiled and given a quick stir fry, with a dollop of fermented bean curd as the sauce on the side. Nothing special, but great comfort food. Oh, and fermented bean curd is also another hugely underrated condiment. 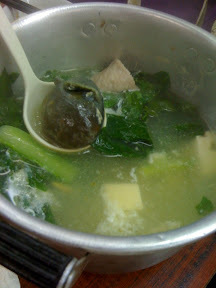 The jovial middle-aged lady who took our order also suggested that we might like to get some soup, and recommended the gai choi soup with tofu, pork slices and century egg. It was a wonderfully cleansing way to end the meal, after all that oil from the omelette, and a good introduction to century egg for the @eatdrinkstagger crew. All up, this meal ended costing us about 40HKD each. Yup, less than $6AUD. Another reason why I freaking love Hong Kong. The oyster omelette looks interesting, i like it singapore style with gooey starch in it, but I agree with you that tangy chilli sauce rocks with these omelettes!